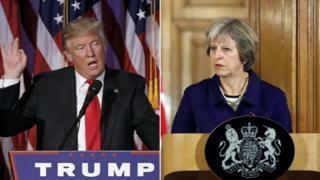 Theresa May and Donald Trump have agreed on the importance of Nato in their second phone conversation since the US election, Downing Street said. The British PM and US president-elect discussed the need for more countries to commit to spending 2% of national income on defence, Number 10 said. They also agreed their national security advisers would meet in the US before the end of the year. And they said they would meet in person "at the earliest possible opportunity". During his election campaign, Mr Trump was critical of Nato, describing the Western military alliance as obsolete. He suggested that the US would think twice about coming to the aid of any Nato ally under attack if it had not paid its "fair share". The UK, which meets the commitment to spend 2% of GDP on defence, has also been urging other countries to increase their contribution. Downing Street said the call by Mrs May to Mr Trump would be part of "establishing a regular dialogue between both of them". The UK government has rebuffed suggestions from ex-UKIP leader Nigel Farage - who has already been invited to meet Mr Trump - that he could help to establish relations between the two governments. The US president-elect also suggested Mr Farage be made the UK ambassador to the United States - a suggestion that was rejected by Downing Street.